Nicehash comes out to be a new technology-based service that is quite interesting and let the users do trade with the hashrate. Yes, whatever hashrate is being generated with the help of the mining hardware can be sold. Also, you can do mining with the help of some crypto algorithms. Thus, it operates smoothly for both the buyers as well as the sellers. But there is no centralized area from where the service is provided by nicehash instead it acts as a mediator between cloud mining and the service provider who is centralized. Although nicehash is a place where investors get a chance to create new coins with more and more mining but still a few days back, it got hacked. Bitcoins of many investors were being hacked. Although, nicehash has not displayed the exact data but according to the Reuters the figure is predicted to be around 4700 bitcoins that have a very high value. Due to this reason, nicehash has put all his operations on hold including the mining operations. There are continuous investigations going on this hacking so as to why it happened. So in this type of situation, you can turn up to the nicehash alternatives. With these alternatives of nicehash having features same as that of nicehash, you can earn good money through the bitcoin mining. You can get profitable mining from these nicehash alternatives and also this is affordable for all the people. The major advantage of these alternatives is that the coins are not stored on the platform and whatever mined currencies are obtained are directly sent to the wallets. Hence the risk of hacking and other theft is also gone. MinerGate is one of the most popular alternatives of Nicehash and it makes the trading easy. Hashing 24, A Scottish Company provides this program. MinerGate is a reasonable program and you can deal in Bitcoin and 14 other cryptocurrencies with low fees. For trading in cryptocurrency, you need hash power. One of the biggest advantages of using MinerGate is that it does not store coins. You get the mined cryptocurrencies directly in your wallets. This cloud mining program is a more profitable way to deal in bitcoin and other cryptocurrencies. With HoneyMiner program, you can make some extra income by investing in Bitcoin. It saves many other costs and is also profitable in nature. HoneyMiner program is available for Windows OS. It has a simple installation process and there are the easiest steps to trade with this program. For using this program, you should compulsorily have an email address. This program has the power to check whether the coin is profitable to mine. With the help of HoneyMiner program, all the different cryptocurrencies convert easily into bitcoin. Whatever is your hardware power, you can still use this program. There is also a Crypto Calculator which shows how much you can earn if you hodl coins for a particular time. 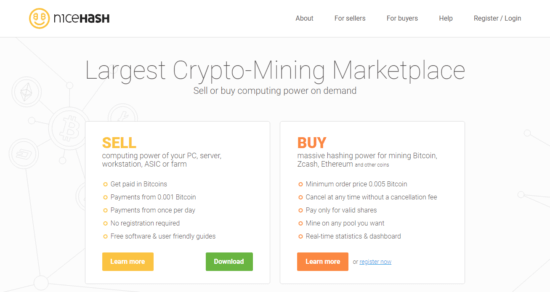 WinMiner is a perfect alternative toNicehash for supplementing income. You can easily mine in any cryptocurrency with this program and earn in Bitcoin or US dollars. This program analyses every detail such as miner to use and coin to mine and much more. WinMiner provides you the maximum returns on investments. In terms of safety, this software is safe to use and helps you in earning more money. This software runs on an operating system of Windows 7 or more. It makes use of network collective computing power to mine the coins and to convert them into cash. It has a blockchain technology to keep the user’s data private. The next on the list is Kryptex Miner in which you can earn in bitcoins, dollars or rubles. This program will turn your PC into an income generator. It works in an easy manner and the set-up of the program is quite simple on the PC. It contains QIWI payment system by which funds transfer into your mobile phone or card. Kryptex Miner identifies your computer hardware andgives you an idea of how much you can earn in one month. Group Fabric is one of the best alternatives of Nicehash for earning bitcoins. It is available for the Windows 8 version and more. This window app has a good user interface with windows and RT support. You can know the real-time stats of your trading in various cryptocurrencies. The app has a fast GPU as well as CPU mining. It has x86, x64 and Arm support. There are lower costs in this software than other platforms. This window app has also mining pool support.